From our earliest days, we at conrad-johnson have recognized the critical role played by component parts in the musical accuracy of electronic circuits. And no parts are more critical than the capacitors. All capacitors have a kind of sonic memory – a recall of the most recently applied charge. The audible effect of this memory is the sonic equivalent of ghost images on television reception. The magnitude of this effect is summarized in a measured property called Dielectric Absorption (DA), which is measured as a percentage of charge “remembered” by the dielectric. This can range from as high as several percent for electrolytic capacitors, which are among the worst in this regard, to less than 1/100th of a percent for Teflon* capacitors. Using 1/DA as a figure of merit, the chart at left gives a visual representation of the types. But the choice of dielectric is not the end of the story. For decades, conrad-johnson has been collaborating with selected capacitor manufacturers to refine capacitor design, seeking the ultimate audio capacitor. The latest CJD Teflon* capacitors offer unique materials and construction simply not available in other capacitors. 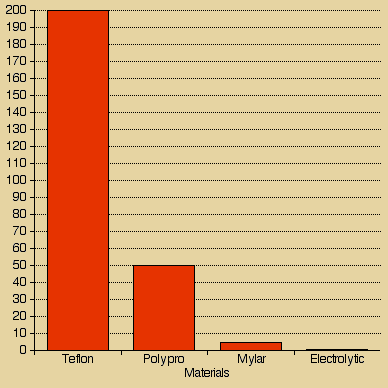 The dielectric film is a proprietary Dupont Teflon* film made to our specifications. A proprietary copper-rich end spray optimizes the electrical contact between end-cap and foil. Even the leads and solder for attachment were developed specifically for conrad-johnson. Our capacitors are fabricated by a top manufacturer with a proven commitment to the manufacture of audiophile quality capacitors. The CJD caps are hand wound by technicians with twenty years or more of experience, and each finished capacitor is subjected to inspection at three separate QC stations. These unique capacitors are, to the best of our knowledge, not equaled by any other capacitor available today. * Teflon is a registered trademark of E.I. duPont deNemours & CO.